Online reputation management is a term that gained steam over the last few years. Your potential customers have access to anything and everything – including reviews – all at their fingertips. It is extremely important to monitor your online reputation and ensure poor reviews are not prominent in the search results. Keep in mind that Google reviews are not the only review source. Niche-focused review sites are often prominent in the search results as well. It is just as important to gain reviews on those websites. Your Google My Business listing is often the face of your business on the web. After you claim the listing, the ability to highlight key business information, promote offers, and monitor reviews from a central dashboard all becomes accessible. Read my previous post on how to improve your ranking in Google Maps. I provided a detailed breakdown on how to claim, or create your business listing. Google reviews are an important part of building trust and improving local rankings. Few people are going to click the company that has negative reviews when other businesses have 50+ positive reviews. Try to gather reviews on relevant third party sites as well because they can be included in your local business listing! Negative reviews can be a huge headache. They can turn off potential customers and tarnish your business image. 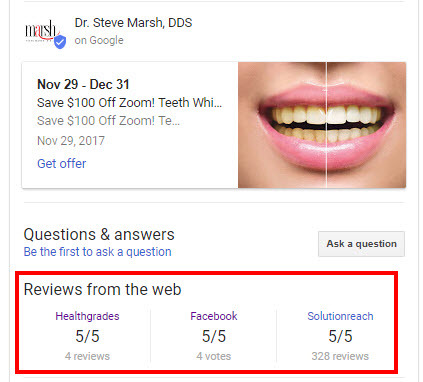 Unethical competitors can leave negative reviews as well, which makes it extremely important to have an abundance of positive reviews in your account. If any reviews contain personally identifiable info, foul language, or do meet Google’s standards, flag it and request removal by Google. We do not advocate fake reviews. If there is a legitimate claim in the negative review, address the issue internally and then reply politely to the reviewer. Your profile will be updated to show the business reply, so keep it professional! An easy way to gather reviews is by creating a direct link to your business listing. Make sure to substitute your own ID with the placeholder text above. Now, you can include the link in your emails, or create a more targeted strategy that involves reaching out to satisfied customers and requesting reviews from them. Google added a number of features to the Google My Business platform in 2017. One of them was the ability to create posts that appear in your listing. This feature is a great way to showcase events, promotions, or blog posts. It’s easy to track clicks on these posts. Just use this handy UTM tracking tool from Google. After you add UTM parameters, you can go to your Google Analytics account and view how each post performed. All businesses are susceptible to negative reviews which can hurt your reputation. Using the strategies outlined above, your business will be positioned to build a strong reputation before issues arise. Ray Kirsch is a Google AdWords and Bing ads certified professional. Contact Ray via email to discuss online marketing strategies for your business.